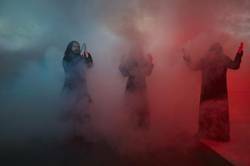 SUNN O))) will be back in action this year, releasing the 4-song Life Metal in April, to be followed by another LP named Pyroclasts that will be announced int he fall. Besides the new material, the band will also embark on its first tour since 2017 (dates below). Both records were recorded with Steve Albini at Electrical Audio studio and later mastered by Matt Colton at Alchemy. Life Metal will be released on Southern Lord.